Please note that we require two full working days (48 hours) notice for repeat prescriptions. Please remember to allow more time at weekends, Christmas time or Bank Holidays, or if you are going away. Whenever possible please use the printed list we provide with your medicines, ticking the items that you do need and crossing off those that you do not need. You can register for Systmonline to view your regular prescriptions and request your repeats. It’s very simple and your message will arrive within our clinical system and allow us to import it into your medical record, saving us time, and of course paper too as we will no longer need to print it off. The system is secure so no-one else can see your details. You can also use Systmonline to book appointments. If you are able to personally bring in your repeat requests to the surgery they can be placed in the secure box in the entrance lobby, or handed in at reception or the dispensary hatch. There is also a prescription box to the left of the dispensary hatch. If we do not dispense for you because you live close to a pharmacy, such as those in Bingham, you can arrange for your chosen pharmacy to collect your prescriptions from East Bridgford for you. Speak to the pharmacy staff about this collection service. 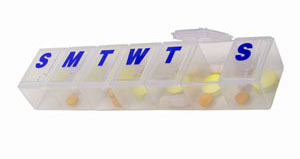 We operate a home delivery service for dispensing patients only every Tuesday. For further information please contact a member of the Dispensary Team (Option 4 if phoning). Prescriptions submitted after 1.00pm will not be processed until the following day. If you will have to pay for 4 or more prescription items in three months, or more than 13 items in 12 months, you may find it cheaper to buy a Prescription Prepayment Certificate. The charge for a single prescription item is £9.00, whereas a three month PPC will cost you £29.10 and a 12 month PPC £104.00.